Armed with Sharpie markers, small wooden tiles, a legacy to honour, and the “heart” to make a difference, SUNTEP Regina students went to work to preserve and reclaim the memory of the many Métis and First Nations children who attended and lost their lives in residential schools. All SUNTEP students participated in the artistic social justice project entitled Project of Heart over the past 2 semesters. Project Coordinator Sylvia Smith, a high school teacher from Ottawa, describes Project of Heart (P.O.H.) as a “hands-on, collaborative, inter-generational, inter-institutional artistic endeavour. Its purpose is to commemorate the lives of the thousands of Indigenous children who died as a result of the residential school experience.” After learning about the truths of Indian residential schools in Social Studies class, Sylvia Smith’s students wanted to do more to bring greater public awareness to the large number of deaths that had occurred in residential schools across Canada. Along with their teacher’s help, they developed a social justice project that is now growing in recognition and has recently been awarded the Govenor General’s Award for Excellence in Teaching. A key objective of P.O.H. is to encourage “ownership” of this historic injustice by the non-Indigenous community. By doing so, non-Aboriginal Canadians can then be moved to take responsibility for the continued oppression of Indigenous people in Canada, and be inspired to take action. Smith also explains that the project “commemorates the families and communities to whom those children belonged. It is designed to bring awareness both to the settler community of predominantly European Canadians and communities of new Canadians from other parts of the world.” Many students of all ages, all across Canada have been involved in the project, by decorating tiles, doing research, visiting with Elders and becoming more aware of the effects of residential schools on generations of Indigenous people. Project of Heart also seeks to expand the opportunities available for the wisdom of Aboriginal Elders to be heard within mainstream, educational/religious institutions. By joining with other groups who are making a space for Indigenous knowledge, institutions can help to change attitudes and behaviours—hearts and minds—as Elders give voice to the traditions that were suppressed by residential schooling. During their involvement in this unique social justice project, SUNTEP students shared stories of people and relatives they knew who attended the residential school. Some were stories of pain, some were stories of relationships that developed while in residential school and some were humorous anecdotes passed down from grandparents and great-grandparents. Through the sharing of stories, we gathered together as students, teachers, artists, and activists to remember the forgotten and piece together this influential, yet poignant part of Canadian history. 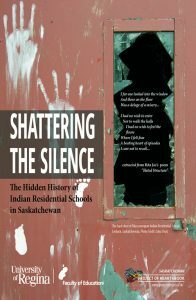 Being able to talk about the residential school experience has been painful to some students, but in some ways it started a healing process aided by research, the sharing of the experience with family members, the smudging of the tiles and visits with an Elder/residential school survivor. 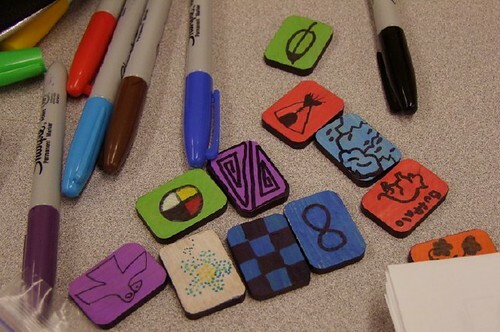 On this journey for understanding through heart and spirit, SUNTEP students decorated 10-12 tiles each (400 in total), with imagery, words and symbols created in memoriam to the Aboriginal culture, language, and self-esteem stripped away by assimilation and racism embodied at residential schools. Through their art, SUNTEP commemorated Ile-a-la-Crosse, a Northern Saskatchewan community with a high Métis population. As evidence of the project’s lasting impact, as the social justice activism component of the project, SUNTEP students have developed lesson and unit plans to use in their field placements so Project of Heart will continue to be shared and honoured. oppression of Aboriginal people in Canada. Art has the power to bring together people from all ages and all walks of life. It can bring about awareness and understanding, promote critical thinking and can also work towards healing. Drawing on tiles will, of course, never erase the horrors of residential schools or reverse the damage done to families and communities, but it can bring about hope; hope that we can someday eradicate the perils of hatred, racism, and ethnocentrism. Sylvia and her students had the vision to bridge the emotional and spiritual power of art to bring about healing to communities who are still in crisis despite governmental “apologies.” This art project is a demonstration of the resiliency of Aboriginal people and their resistance to the cultural collision between Canada’s Aboriginal peoples and European colonizers. We are still valiantly fighting to reverse the devastating impact that years of oppression has had on Canada’s Aboriginal cultures and traditions. We hope that the inter-generational damage will not be forgotten but used as a reminder that this cultural genocide must never happen again! 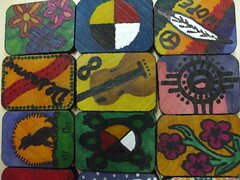 You can check out the SUNTEP Regina’s tiles and more about the program at http://projectofheart.ca.